Rivers State Governor , Nyesom Ezenwo Wike has declared that the leadership of the Independent National Electoral Commission ( INEC) has handed over original copies of result sheets to the Minister of Transportation, Rotimi Amaechi for the planned rigging of the December 10 rerun elections . 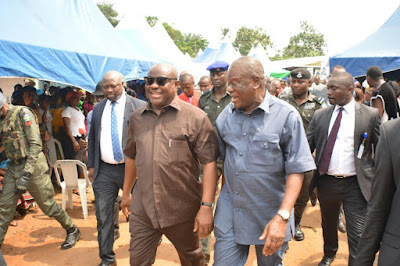 Flagging off the construction of the Ulakwo II-Afara–Nihi in Etche Local Government Area on Wednesday ,Governor Wike noted that the Minister of Transportation , Rotimi Amaechi made the disclosure on Tuesday in Abuja during a meeting of Rivers APC leaders. The governor said that he is possession of the proceedings of the Abuja illegal meeting of the APC at Abuja . Governor Wike stated that Amaechi assured the Rivers APC leaders at the Abuja illegal meeting that the original result sheets supplied by INEC would be used for the December 10 rerun elections to facilitate victory for unpopular APC candidates . He said : “While we are working for the people of Rivers State to convince them to vote for us, the APC is busy working with INEC to rig the rerun elections . “Amaechi told them at the illegal meeting that Sheriff is working for them (APC ) and that they have finished PDP . Sheriff cannot finish PDP , he can only finish himself . “On December 10, follow your results bumper to bumper. Don’t allow anyone to swap results . I urge the Etche people to follow their results”. The governor informed that the Rivers APC members who were arrested printing fake result sheets for INEC were transferred to Zone 6 Police Command headquarters in Calabar where arrangements have been concluded to take them to Abuja for the Director of Public Prosecution at the Federal Ministry of Justice to formally release them in line with the request of APC . He assured the people of Etche Local Government Area that he will stand with them to resist the rigging of the December 10 rerun elections in the state . He added that APC has concluded plans with the Federal Security agencies to arrest the chairman of Etche Local Government Area , Ikwerre Local Government Area and other leaders of the party to create room for the rigging of the rerun elections . On the construction of Ulakwo II-Afara-Nihi Road , the governor said it will be completed as scheduled and in line with approved specifications . He said that the Etche people were abandoned for several years , pointing out that his administration would always execute developmental projects in the area. Earlier, the State Commissioner of Works, Mr Bathuel Iheanyichukwu said that construction of the road will help in the rebuilding of the economy of the area. The flag-off of the construction Ulakwo II-Afara -Nihi road was witnessed by elder statesmen , State and National Assembly members , Commissioners , women and youth groups .